Recent Scientific Fraud in Cardiac Stem Cell Research, How Labii ELN & LIMS can Help Avoid Similar Problems in the Future? The world of pharmaceutical research has been rocked by the mid-November news that Harvard and Brigham have requested for the retraction of 31 cardiac stem cell research papers by the famous Dr. Piero Anversa. He was one-time laboratory director at Harvard Medical School and Brigham and Women’s Hospital in Boston. Officials from the two institutions confirmed his studies based on the idea of treating damaged hearts with stem cells included fabricated and/or falsified data. This was in a statement to Retraction Watch and STAT earlier this October. Dr. Piero Anversa and his team virtually started cardiac stem cell research in 2001 after claiming they had identified stem cells (c-kit cells) which supposedly had the ability to regenerate cardiac muscle. Their claim excited scientists across the globe although numerous research teams attempted and failed to reproduce their results. However, their work inspired the creation of many start-up companies targeting the development of new treatments for stroke and heart attacks. The National Institutes of Health notably funded a clinical trial in the regard. Nevertheless, the first major scenario that rang loud alarm bells about the research was a $10 million settlement in April 2017. The scientist was accused of submitting fraudulent data in order to secure federal research funding and Brigham and Women’s Hospital accepted to pay the settlement to the federal government. Brigham made the settlement with the U.S Department of Justice, even though the U.S Office of Research Integrity which is in charge of investigations on research misconduct when it involves National Institutes of Health Funding, didn’t make a finding in the case. The relation between the settlement and this recent call for over 30 of Anversa’s papers to be retracted isn’t clear. The Journals in which the 31 papers appeared have not been highlighted by Harvard and Brigham, but about 8 of his papers had previously been retracted and corrected. Many for failing to disclose conflicts of interest. The Circulation journal notably retracted on of Anversa’s papers in 2014. The school and hospital started reviewing the popular doctor’s publications in January 2013 and his lab at the Brigham and Women’s Hospital was closed as he departed later in 2015 with increasing questions popping up about his research. At one point, Dr. Piero Anversa and his colleague Dr. Annarosa Leri even unsuccessfully sued Harvard and Brigham for alerting journals to issues in the work in 2014. As the events keep developing, spokeswoman for the AHA (American Heart Association/ American Stroke Association), Suzanne Grant, highlighted the organization’s role in the retraction and correction of a 2012 paper co-authored by Dr. Anversa in 2014. She added that the AHA was evaluating the findings of Harvard and would once again take all necessary action. One thing everyone in and out of the industry agrees upon is the need for transparency. Dr. Harlan Krumholz, a cardiologist at Yale even told STAT and Retraction Watch that, “the scientific community deserves to know what the findings were, the reasons why the papers were retracted, and the recommended way forward”. Furthermore, the million-dollar question is, ‘What happens to work based on Dr. Anversa’s work?’. How Labii ELN & LIMS Can Help Avoid Similar Problems in The Future? To avoid the fraud and the wasting of tax payer’s money, the NIH and other grant organizations should check the applicant’s raw research notes on their grant applications. I also urge the publishers to make it a requirement for scientists to provide the raw experiment notes as a compulsory attachment for every publication. With technology presenting new solutions to many global problems, Labii’s ELN & LIMS is perfectly equipped to make the above suggestion possible and to help scientists prevent scandals like this shocking call for more than 30 research papers to be retracted. The Electronic Laboratory Notebook software simplifies data management and guarantees security, as well as transparency, in so many ways. 1) Labii ELN & LIMS takes away the control of data from individuals as the software provides a Unique ID to all records. The ID will incremental by itself as the research progresses and each experimental note created is given its unique ID to avoid any fraud from manually faking the notes. 2) With Labii, no data can be deleted. Labii keeps all results of scientific research, whether wrong or right. This allows for pinpoint accuracy and transparent tracking. 3) Labii keeps track of all user activities. The software records every single change, making data falsification practically impossible. 4) Labii creates a new version for every change which is stored, facilitating the tracking process of research. 5) Every tech enthusiast must be aware of the amazing security of blockchain technology which is making waves in cryptocurrency over the last decade. Labii ELN & LIMS makes use of blockchain technology security to make hacking impossible. This feature also makes the manipulation of historical data impossible. The world of research would do well with some transparency and Labii ELN & LIMS brings a fantastic way out. If you are reading this, then you must have an idea about the important role Electronic Laboratory Notebooks (ELNs) and Laboratory Information Management Systems (LIMS) have to play in the global quest for safer, quicker, and much more effective data management tools in our modern laboratories and the pharmaceutical industry in general. Electronic Laboratory Notebooks (ELN) has long been predicted by articles and technology as far back as the 1990’s as having the futuristic potential to solve data management problems for researchers. This dream is slowly becoming a reality with more and more scientists and organizations welcoming the switch from traditional methods. However, the wide variety of available options today is making the task of choosing the perfect one even more daunting. In fact, a 2016 research study conducted by the University of Southampton, found 72 active products. And a Delft University of Technology petroleum engineer, in the Netherlands, Sian Jones, describes the scenario as insane and very confusing for researchers. 1. Understand What You Need! Experts confirm that the importance of any purchase depends on whether it solves problems and meets stated goals. Therefore, evaluating any ELNs without first of all outlining the criteria to be met for a practical choice is the wrong way to go. 3) And you need a customized function to analyze the results. Other things that are good to consider are the type of data to be stored, how it should be stored, the workflow, collaboration facilities, data quality improvement, security, maintenance, scalability, and upgrade potential. All these will help you highlight specific MUST-HAVE features that narrow down your search to vendors more relevant to your needs. Avoid searching for ELNs that directly replace your paper methods and make sure you consider letting technology to drive productivity and collaboration. Also, pay attention to the fact that you need an ELN that can seamlessly support your company’s growth with easy upgrade and uncomplicated additional applications in the future. It is also helpful to read some comments online. Articles like the Comparative Analysis of Labii ELN & LIMS and Benchling Software Platform is very resourceful. After settling on a shorter list of potential ELN’s perfect for your organization, you can move on to utility aspects. Seeing a product in person will facilitate your understanding of how it works and an online demo can provide vendors with the easiest way to show the features to you. The goal of this demo is to further narrow down your list of ELNs that could meet your requirements. All the products are different from each other and finding the features you want by yourself could be really difficult. For example, the features of Labii identify more with organizations that value data security, need customizations on specific data to store, and seek advanced functionalities in ELN and LIMS meanwhile, Benchling has the properties suited for end users looking for an ELN with molecular tools that are easy to access. Getting an online demo from them shouldn’t cost anything. This is also a good time to ask questions. Be sure to tell your vendors what are the MUST-HAVE features, they will emphasize on these features and will let you know directly whether or not such functions are available. Check with your vendors how it could be done if your required function is not available, is it possible to customize, how much will it cost, et.al. 3. Get a Hands-on Experience, Get a Free Trial! Although a majority of companies have free versions of their ELN software, they always have limitations on the functionalities, the data storage, number of users, etc. However, signing up for a free trial can give you a better sense of what value it adds to your organization or research setup. The free trial period could also present the best time to educate yourself and other members of your team on how to use it. After the trial period, you can then propose the customization of a few more features that will make the ELN even more perfect for you or decide to try out another option on your narrowed list without any extra expenditure. 4. Negotiate A Good Price! Most ELN vendors usually have price plans that are customizable and negotiable. With these in mind, negotiate the price that reflects the best deal for you both and discusses the development of any special features you may need. Labii also provides Pay Per Use options, it allows you to use full functionalities of the ELN & LIMS without putting in too much budget upfront. If you can’t afford an expensive ELN or LIMS, The Pay-Per-Use option is a great option for you to try. Follow this four-step guide and easily get yourself the ELN software that is designed to serve the specific needs of your organization. As technology continues to make waves in research and the molecular biology industry, Labii is staying true to its mission of working daily to develop new amazing ELN and LIMS facilities for scientists. Added to the many unique Labii ELN & LIMS features, recent innovation sees the data management software capable of gene sequence visualization. What Can Labii Do Now? This development allows Labii users to plot publication quality circular and linear sequence maps of the plasmid. They would be able to do this a lot more conveniently using data directly from their ELN (Electronic Laboratory Notebook) without an external application. Plasmid refers to an extra-chromosomal element, typically a small circular DNA strand with self-replicating properties found in the cytoplasm of some bacterial cells. Plasmids are used widely in laboratory gene manipulation serving as vectors for new genes introduced into bacteria. They facilitate the recognition of foreign “recombinant” DNA by the protein-making mechanism of a cell. Plasmid maps are graphical representations of plasmids, showing the locations of main identifiable landmarks on DNA such as restriction enzyme sites, plasmid name, length, genes of interest, etc. 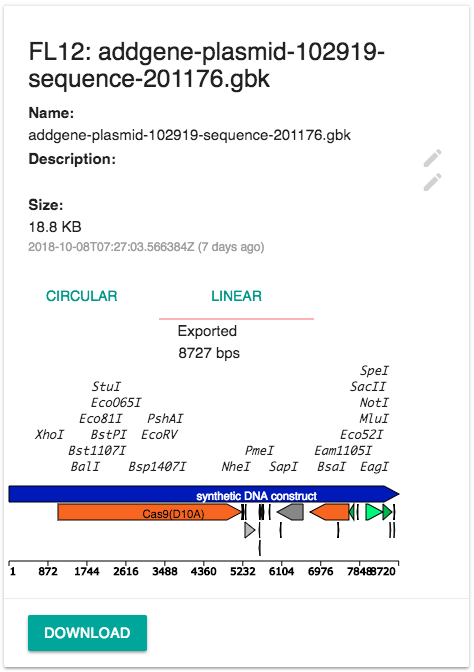 Using the file widget of Labii, scientists can now generate first-class plasmid map displays and the supported file types are *.gb, *.gbk, and *.ape. 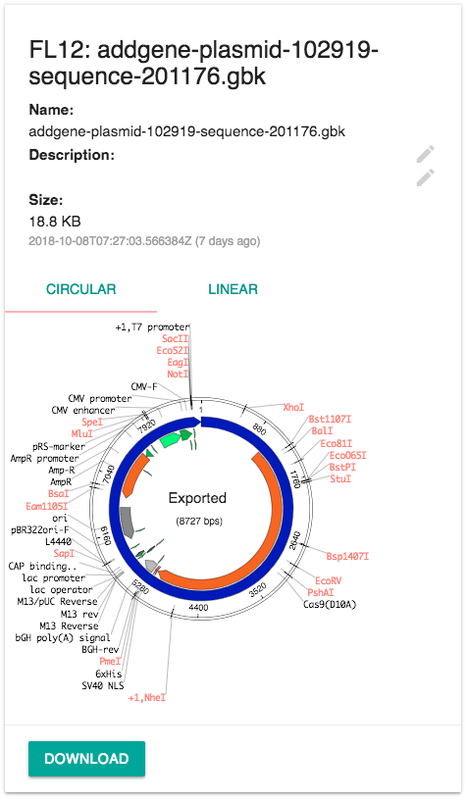 This new high-tech Labii feature integrated into the ELN means the software can be used to turn GenBank annotations into circular and linear sequence maps in no time. And more. Data for plasmid mapping appears to be complex puzzle pieces which conventionally needed to be fitted together through somewhat tedious trial and error processes. Getting considerable automated assistance from Labii’s futuristic and collaborative platform is a major turning point in sequence visualization. Plasmid maps are used to plan cloning strategy and to verify when a DNA clone has been successfully constructed. These massively important graphics have so many related applications for scientists and this addition makes Labii an even more complete molecular Biology package. There are many extra benefits of this integration in comparison with other isolated sequence visualization programs. One major advantage of using Labii is the facility of uniform visualization which happens through custom annotation libraries. Teams can share their sequences and tools for everyone to be on the same page from the very beginning of experiments. Beyond that, the scientists across teams and bigger organizations get the opportunity to visualize sequences exactly in the same way. The unique flexibility of Labii extends even more with its new sequence visualization feature. Proper standardization is a key requirement in research and Labii duly recognizes this with top-notch multi-sequence alignment tools. Prestored tools and powerful import features from high-standard external databases allow scientists to standardize visualization all through their organizations, in spite of the particular needs of individual teams. Multiple sequence comparison is an extremely rare facility for your Electronic Laboratory Notebook and uncountable professionals in this domain will jump to this without a second thought. Labii is dedicated to continuous innovation and improvement. So, with this release, you can expect much more very soon. We are working on adding the widget that will allow the editing of the plasmid sequences, enabling scientists to design the sequence directly in Labii ELN & LIMS. A majority of scientists now realize the importance of Electronic Lab Notebook (ELN) and Laboratory Information Management Systems (LIMS) for effective, secure, and much more expansive data management especially in research and the pharmaceutical industry. I am an expert in the industry, with valuable experience working closely with more than 300 biotech companies/laboratories. Being the founder of an ELN myself, I will layout a resourceful comparison between two great options to consider as replacements for your traditional data management methods i.e Labii ELN & LIMS and LabWare ELN and LIMS. After reading this article, you will understand the differences between Labii and LabWare with regards to Who they Are, Deployment and Integration, Highlight, Design (ELN & LIMS), Customers, Support, Price, etc. This is will very well save you from the stress and time-consuming process of evaluating the dozens of ELN & LIMS in the market to pick the one that best suits your organization. Let’s now dive into the different ways Labii and LabWare are set up to facilitate, secure, and basically modernize data management. 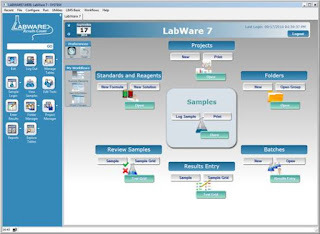 Founded back in 1987, LabWare is an established developer of Laboratory Information Management Systems and Electronic Laboratory Notebooks and its newest version is LabWare v7, ELN v3. On the other hand, Labii Inc. is a Silicon Valley startup which launched in 2014, engaged in the development and distribution of Electronic Lab Notebook (ELN) and Laboratory Information Management System (LIMS). With a third version (Labii ELN & LIMS v3.0) already, Labii comes up with regular upgrades to their software consistently adding new features and improving the technology. LabWare is more interested in stability, with just 7 versions in almost four decades. Labware has achieved much success in its more than 40 years of existence. They did this by meeting its commitments and even expectations in small and large, routine and complex and well as local and global projects with its LIMS and ELN solutions. However, there seems to be an unbridged gap with developing computational technology making it possible for certain unsolved old and new problems to be addressed. This explains the emergence of startups Labii injecting new life and functions into ELN and LIMS. 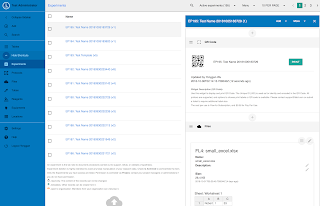 Labii presents a single solution for all research data, with a high level of customization capacity according to the data type you want to store (notes, reagents, protocols, etc. ), the data attribution and the detail of each record. The system of Labii is cloud-based with the software installation, operation, and maintenance overseen by Labii. It also provides a licensing option that allows customers to store data in their own data centers. Labii creatively merges the ELN and LIMS into one system with the ELN treated as a special type of data managed in LIMS. Also, the data and its processing are segregated physically or virtually from the customers. Unlike the Labii, LabWare has two separate software. The ELN is completely different from the LIMS and both systems are premises-based. So, a customer installs, operates and maintains the software on its own servers. Without leaning too much into one direction, the debate on where the data should be preferably stored is unsettled, but each has its advantages and disadvantages. For instance, a cloud-based system (Labii ELN & LIMS) is usually cheaper, easier to manage and much secure even though, it doesn’t offer full control. Contrarily, you get full control over your data in an on-premises system (LabWare) but there’s extra expenditure in the purchase and management of computer infrastructure together with the risk of losing data from fire damage, water, or an angry employee. Many more people go for a Cloud solution based on mindset, budget, and the law. People are starting to believe cloud solutions are safer, and they are willing to put in a little budget to test the system in the cloud instead of pulling a huge budget to purchase a system and use it locally. Also, the records at cloud are now widely accepted for patent applications, et.al. The design of Labii is modern, user-friendly, beautiful and materialized. The same can’t quite be said for LabWare whose design is still based on their 1990 framework. Moreover, Labii is the first and only ELN & LIMS using the security of blockchain technology making it impossible to manipulate data falsely. It meets the requirements of GLP and FDA 21 CFR part 11. LabWare is in perfectly in line with ISO 9001 regulations. Labii is designed with a flexibility that allows the storage of virtually any type of data including Samples, Reagents, Equipment, Location and custom tables for data like Proteins, Cell lines, etc. LabWare is much more fixed, and can only be used to manage data that falls in the categories of its standard modules i.e samples, projects, reagents,. With Labii, widgets that track the quantities of samples and reagents used in experiments are available. Whereas LabWare strictly allows for the tracking of sample shipment. 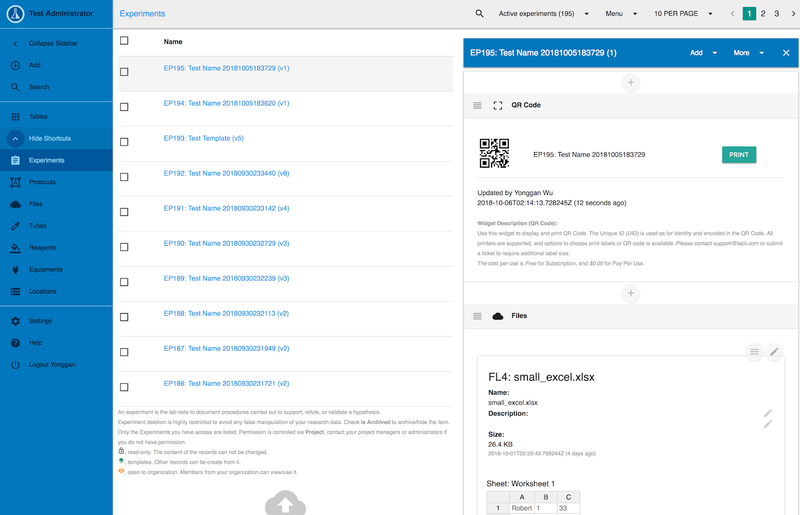 LabWare’s workflow management feature is quite established meanwhile the newer Labii is moving towards a much more modern method of management thanks to the constant upgrade from customer feedback. There is a customizable feature with Labii lacked by LabWare and most other ELN software in the market. It offers an API which makes the customization and automation of additional data processes possible, facilitating data analysis related to the specific needs of scientists. The flexibility of Labii makes is great for companies of any size meanwhile, LabWare best works for only big companies. Submitting a support ticket to Labii’s support team gets your request attended to with 24 hours. There’s a Paid Support option for immediate assistance which costs ($50 per hour). LabWare’s support is pretty expensive. Consulting services from their support team cost around $160,000 for 100 days, excluding travel expenses. Only the very big companies can afford this. LabWare has a native Mobile App based on its Ads, though I couldn’t find it in both the Apple Store and Android Store. The mobile and Tablet Support at Labii is in the browser with native app currently being developed. Configuration and training your personnel on how to work with Labii ELN & LIMS is free. At LabWare, it costs $7,300 to get trained. Furthermore, Labii has two payment options to serve different organization sizes. The Subscription of $960/user/year and the Per-Per-Use option which costs only $0.1/record. Labii is clearly offering more flexibility and utility at less. We can confirm from the analysis above that LabWare is an established, expensive, and comparatively outdated, but much more stable solution to data management. This makes it a great choice for giant companies not too worried about the cost and are looking for stability with little or no changes over a considerable time period. However, this lack of scalability and high prices are key problems targeted and solved by Labii. The basis of Labii is very much inclined towards new possibilities, agility, and flexibility with advanced technology consistently introduced to meet the requirements of the future. Labii can potentially develop into one of the cornerstone data management solutions in the world of research and the pharmaceutical industry. Whereas LabWare’s conservative approach risks becoming totally out of use due to it lacking the capacity to compete by meeting future requirements. Please see my detailed comparison notes at Labii ELN & LIMS vs LabWare, Which one should I choose?